A hospital where a young mother and her premature baby died "could have done better", an inquest has heard. Rochelle Lyle, 26, was admitted to hospital in Bedfordshire when she was 26 weeks pregnant suffering from a headache on 20 March 2017. The inquest heard Ms Lyle, from Luton, was not given a CT scan which could have detected bleeding on the brain. Dr Bright Gyamoph apologised to Ms Lyle's family on behalf of the Luton and Dunstable Hospital Trust. The inquest in Ampthill, Bedfordshire, heard Ms Lyle was treated for suspected sepsis but was not seen by a neurologist. She was found unresponsive in her hospital bed on 25 March having suffered a heart attack. 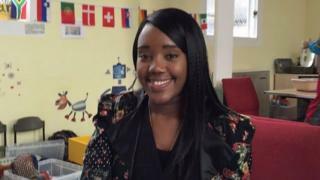 Her daughter Imaani was delivered by an emergency Caesarean section but there was a delay of six minutes because a scalpel could not be found, the Bedfordshire senior coroner Emma Whitting was told. Ms Lyle, a psychology graduate, was then rushed to the specialist neuroscience unit at Addenbrooke's Hospital in Cambridge, where she died the next day. Imaani died six weeks later on 4 May 2017 at the Luton and Dunstable Hospital in the arms of her grandfather Laurie Lyle. Paediatric specialist Dr Jean Egyepong said Ms Lyle had suffered cardiac arrest, which meant no oxygen was sent to Imaani, who suffered a brain injury. A CT scan was then performed and revealed an abnormality in Ms Lyle's brain. Apologising to the family, Dr Bright Gyamoph, the clinical director for obstetrics at the hospital, said: "We could have done better." Since Ms Lyle died, he said the hospital had learned lessons and changed procedures.